Total running time 25 minutes. A delightful, charming children’s story perfect for the whole family to enjoy! This is the true story of six year old Susie Wirth, an American Heidi, living on top of Aspen Mountain with her parents, who run a restaurant. Here we look at a day in Susie’s life. Each day she’s the first person to hit the slopes as she travels to school, stopping along the way to meet her animal friends like Snowball the Rabbit. The film unfolds under the old single chairs, set against the mining town of Aspen and Skiing as they once were. Enjoy the original soundtrack including yodels and whistles. This film is filled with nostalgia for a time when skiing was a way of life. Produced and directed by Fred Iselin. Sponsored by Heinz 57. 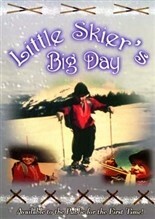 Donated to the U.S. National Ski Hall of Fame by Elli Iselin. Total running time 25 minutes.